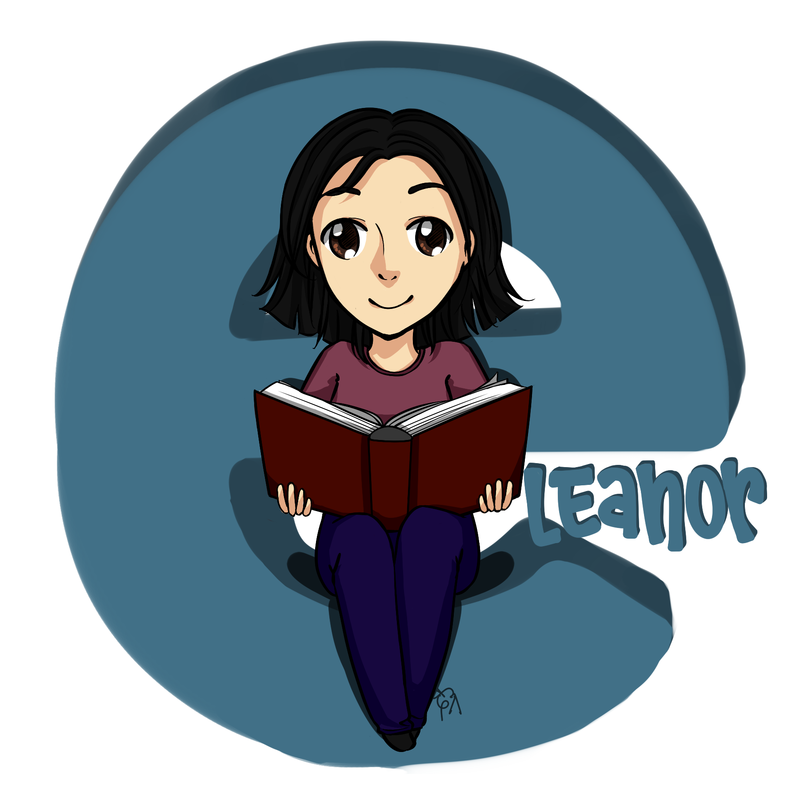 My talented friend Ann (a fellow linguist and Georgian chorister) drew this for me! A tour-de-force. That is all. I really liked this book, but I was distracted by the mechanics of Judith relearning to talk. How much of her tongue did she have left? Was it really realistic for her to recover the ability to make coronal sounds? Wow, this was so good. It reminded me of In the Shadow of Blackbirds and A Northern Light, both books I love. This exceeded my expectations and was really enjoyable. The dystopia(s) felt more realistic and stretched credulity less than most. I also liked that the heroine was a midwife instead of a natural fighter who spends ages training in martial arts. 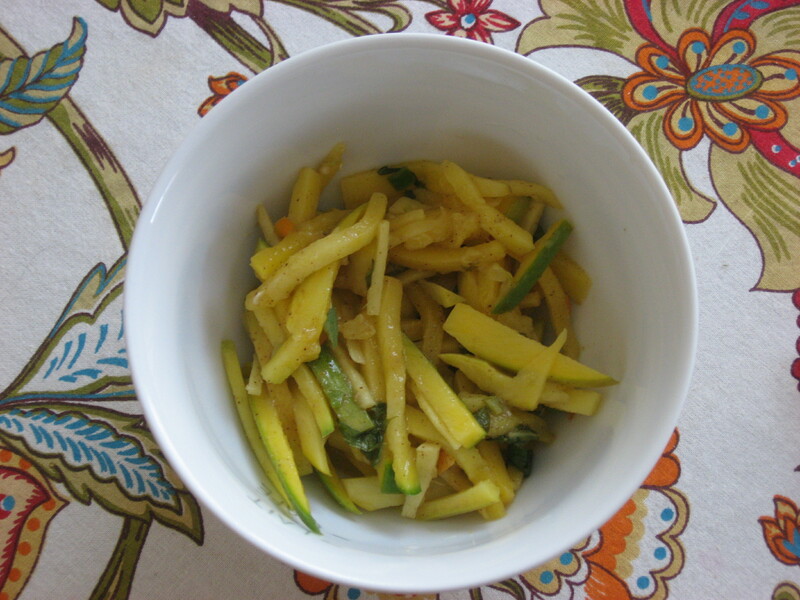 I’d been saving up vegetable recipes I wanted to try, and in the past few weeks I’ve finally gotten around to making most of them, with lots of farmers market produce. It helps that they’re all pretty well-suited to hot summer days. 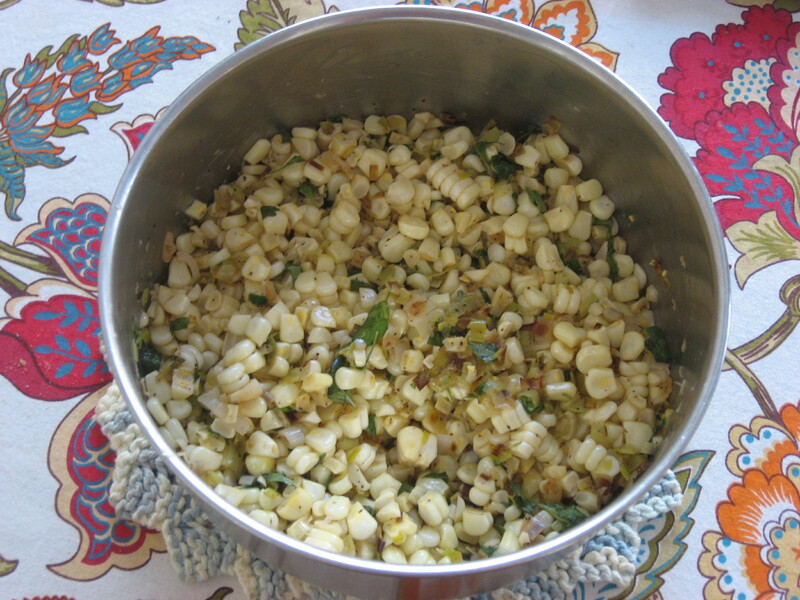 South Indian Stir-Fried Corn with Basil and Leeks: This was delicious, the best recipe of the lot. 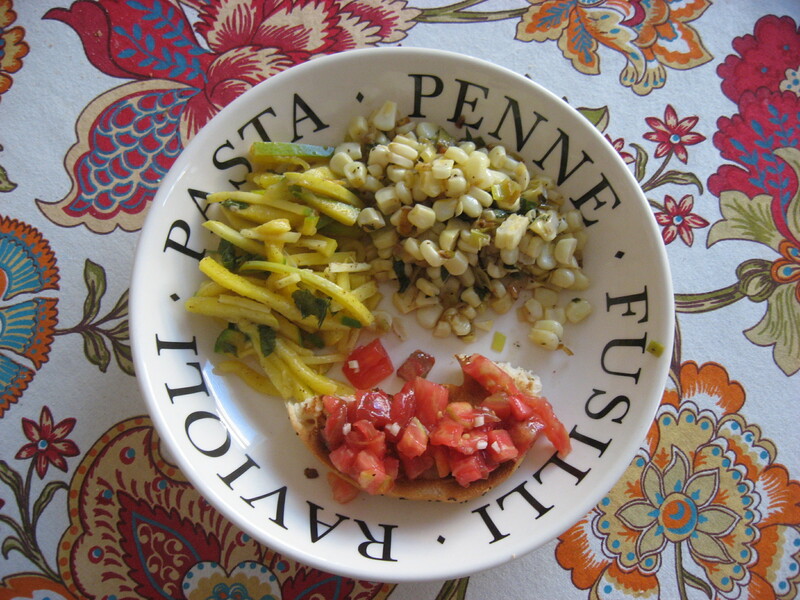 I used Thai basil because I’d bought it for another dish. 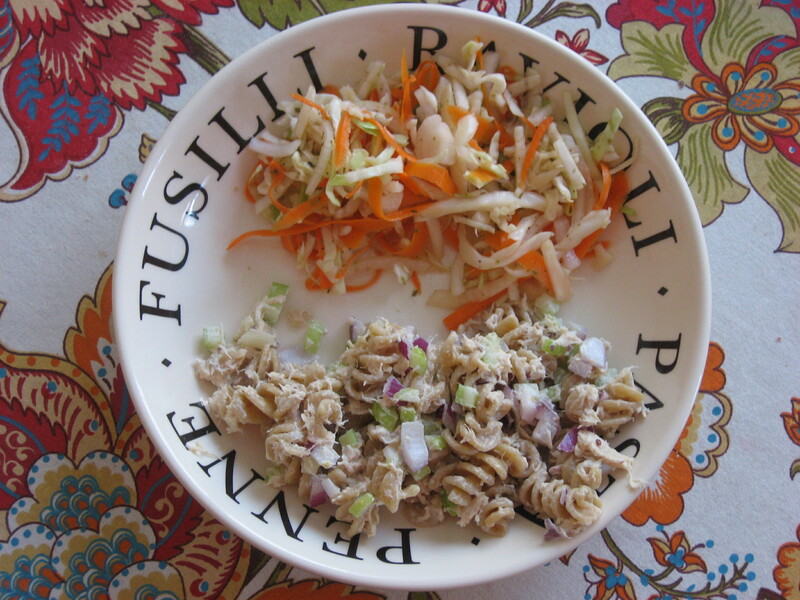 Curtido (with tuna pasta salad): A sort of spicy slaw traditionally served with pupusas, a Salvadorean dish. After being disappointed by the mildness of green Thai chilies from the farmers market, I daringly put four red Thai chilies from the same vendor into the curtido. It’s really spicy. But refreshing. Yesterday I talked about my discomfort with Louis Sachar giving his main character a made-up, generically ethnic name in his new novel, Fuzzy Mud. I wanted to talk about making up names in fantasy too, but that post was getting way too long, so I decided to write a Part II. I objected to Sachar making up a pseudo-Indian last name in a novel set in the real world, but what about in a novel set in an invented world? There, I think it would have been okay, particularly if it was clear that the characters weren’t intended to be Indians transposed into a fantasy world but instead lived in an Indian-influenced society. Does naming a character in a fantasy novel Tamaya Dhilwaddi contribute to diversity in literature? Maybe. This question is trickier in fantasy because languages, cultures, and skin colors don’t have to align the same way in a made-up world as they do in the real world. The way the concept of race is constructed in a fantasy world may be totally different from the ways it’s constructed in the real world, but of course readers will still encounter the fantasy world through the lens of their real world understanding of race. Probably the best way to increase diversity in fantasy is to write explicitly non-white characters, but I think giving characters names that real world readers will code as non-white can help too. In essence, I think fantasy writers should feel free to name characters however they want, including giving them names that sound “vaguely X,” but we should do it with our eyes open. One option for naming characters in a fantasy world is to simply pick a real world language/culture and draw names from there. Maybe the world itself is inspired by a particular real world culture and you want the names to match, so to speak. An example of this is Cindy Pon’s Silver Phoenix, which is set in the Chinese-inspired Kingdom of Xia and features characters named Ai Ling and Chen Yong. Once it’s firmly established that a fantasy culture and its language have real world counterparts, a name that doesn’t fit the pattern and has no good reason not to will be jarring, at least to readers who can tell the difference. I once read a fantasy novel in which characters from a certain country spoke Mandarin Chinese. It wasn’t called Chinese in the book, of course, but the one example phrase of the language given in the text was actual Mandarin, not a made-up Mandarin-inspired phrase. The problem was the names of the characters who came from this country, and indeed the name of the country itself, were in extreme violation of Mandarin phonotactics (permitted sound combinations). I just couldn’t believe that the characters could simultaneously have the names they had and speak the language they were purported to speak. That’s not to say I don’t think fantasy authors have the freedom to change things up. It just has to make sense. For instance, maybe you want Chinese-sounding names, but your invented culture has different naming practices, so family names come after given names instead of before or given names always have three syllables instead of one or two. Why not? Or maybe your fantasy world/culture and language come from two different real world sources. Say, a Chinese-inspired society where the language and names are Italian. It might seem weird to readers, but it doesn’t make your world internally incoherent. You can also have multiple influences for both culture and language (an Indonesian/North African-inspired society with a language that looks both Germanic and Bantu! ), but here you do have to be careful not to combine incompatible elements (whether cultural or linguistic). Once you’re doing something like devising a Germano-Bantu hybrid language, you should probably figure out the rules for yourself so you can make sure your names and any phrases you put into your book are consistent and make sense. Somewhat in the same vein of the Germano-Bantu language, maybe you want your character names to sound French but not actually be French, or maybe you just want them to sound vaguely French. You’re going to be making up names, but if you want readers to get a French vibe from them, you’ll have to make sure you’re using the sounds and sound combinations that French actually allows. Depending on how far away from French you want to get, you may decide to break some rules governing how French words and names can be constructed, but you should decide exactly which rules these are before you start throwing names together. Of course, you can always decide to invent character names (and perhaps a language) from scratch. You’ll probably inadvertently have some real world influences, but they may be so deeply buried that your readers see nothing but a fantasy name. If you do this, you should probably still establish a sound inventory and make some rules about how sounds can be put together so that your names will feel like they come from the same language. No matter which approach you take, but especially if you draw inspiration from real world cultures and languages, readers may criticize the way you named your characters. This is something you have to accept, and if readers have a point, all you can do is acknowledge it and try to do better next time. It’s not only errors in linguistic consistency that readers may take issue with. Names taken from real languages will have real world resonances even when given to invented peoples. If the only characters in your world to have, say, Chinese-inspired names are all servile and buffoonish, readers may object. In Sparkers, I chose to use real world names. I’ve talked about this a little before, but basically I made an aesthetic choice to give north landers Hebrew names and Xanites Arabic names. If I were building the world all over again, I’m not sure I would make the same choice. I think this naming scheme almost inevitably evokes Israel/Palestine, even though the names and the axes of power line up differently in my invented world. Moreover, I know I’ve been accused of appropriation at least once for giving the majority of my characters very Jewish-sounding names despite not being Jewish myself. This is a legitimate criticism. Although I haven’t heard of any complaints, I also played around with naming practices and flouted the principle of internal consistency. Firstly, the last names of the characters in Sparkers are actually first names (though some can probably also function as last names in the real world–I don’t know as much as I should about the distinction between Hebrew and Arabic given and family names). This was a deliberate choice I made, so even if some readers find it odd, I hope they don’t think I did it out of cluelessness. Secondly, I tried to make the characters’ names closer to the original Hebrew or Arabic and less Anglicized (though I retained some Anglicization, for instance by omitting the glottal stop in Leah and in Yakov, which should also have another a), but in some cases, I blatantly violated my own principle. The most notable case is Caleb. If I had treated his name like the other characters’, it should have been something more like Kalev, but I decided I wanted his name to look more familiar to English-speaking readers. I took some liberties with Marah’s name too. The girl’s name Mara actually ends in a glottal stop, not an h like Sarah or Leah. Marah with an h is a place mentioned in Exodus, but not a given name. Nevertheless, I spelled Marah’s name with an h because I liked it. Melchior’s name is another one that doesn’t quite fit; while it has Semitic roots, it’s not really Hebrew or Arabic, so in the world of Sparkers it’s actually an odd name for him to have. This is something I know, but it’s not something that’s on the page, so readers might well think I didn’t know what I was doing. Finally, I made up some proper names in Sparkers, some of which are not linguistically coherent with the rest of the naming scheme. For instance, people from Xana have Arabic names, but the country name Xana is made-up and doesn’t look Arabic, particularly in its orthography, since the x represents a [ʃ] (sh sound). I could explain away this inconsistency by saying that the name of the country is a holdover from an earlier civilization, but that’s not in the book. Ashari names I made up include the surname Imael, the covered market called the Ikhad, and the school name Firem. Some of these invented names may not be possible Hebrew words. Firem is the only one I know is probably phonotactically bad; outside of loanwords, I believe Hebrew doesn’t permit initial f. By the time someone pointed this out to me, though, I was so used to the school being called Firem that I didn’t change it. In Sparkers, I took the route of drawing almost all names directly from real world languages. I made a few mistakes with linguistic consistency and also broke my own rules a few times out of personal preference, but I take responsibility for all these choices and recognize that people have the right to critique them. [ARUN] RATH: I’m curious about the name of our female protagonist here ’cause you – arguably, your most famous character was Stanley Yelnats. His name’s a palindrome. RATH: I was wondering if there was something I was not getting about Tamaya Dhilwaddi. RATH: Sounds vaguely Indian (laughter). SACHAR: Right. It was – I didn’t want to name like Sarah or Vanessa or – you know. The world’s getting much more diverse. And I wanted her to sound more ethnic, but I didn’t really have any specific ethnicity in mind. So I made up a name that, like you said, sounded vaguely Indian. It could be vaguely Japanese. It could be a lot of things. There’s nothing more to it than that. Sachar’s response bothered me. He starts out by implying that he wanted his main character to contribute to diversity in children’s literature, which is all well and good and very in the spirit of We Need Diverse Books. But then he says he “wanted her to sound more ethnic,” where ethnic obviously means non-white/Anglo-American (because of course only people who are not white/Anglo-American have ethnicity). I don’t like this wording, but I wouldn’t have minded if Sachar had then decided to make his main character Mexican-American or Vietnamese-American or some such and given her a name accordingly. Instead, Sachar admits that he “didn’t really have any specific ethnicity in mind” and so “made up a name” that he thought could be “vaguely Indian” or “vaguely Japanese” or “a lot of things.” I’m uncomfortable with this. First, the name itself: Tamaya Dhilwaddi. Tamaya doesn’t strike me as Indian or Japanese or anything particularly, though it suggests a non-white character more than Sarah or Vanessa does. It also sounds like a name that real people probably have, and indeed, a Facebook search shows there are Tamayas out there. Dhilwaddi, on the other hand, immediately looks Indian to me. If Sachar hadn’t said he’d made it up, I would have assumed it was an actual Indian last name. It’s mainly the initial dh, which looks like it represents a voiced aspirated stop, a type of sound that’s common in Indian languages and not so common in other parts of the world. There is no way that Dhilwaddi could be construed as Japanese to anyone with a passing familiarity with Japanese names. I can’t imagine what else it could be construed as either. Googling reveals that Dhilwaddi is truly made up; the name doesn’t exist except in Fuzzy Mud. It’s notable that the NPR host, Arun Rath, says the name Tamaya Dhilwaddi “sounds vaguely Indian” because, as far as I can tell, Rath is himself Indian-American. He may have said “vaguely Indian” because he knew Tamaya Dhilwaddi wasn’t a real Indian name. Someone like me, on the other hand, would have believed that Dhilwaddi, if not Tamaya, was an actual Indian name. This suggests to me that Sachar’s imagined audience is “non-ethnic,” i.e. not Indian-American or Japanese-American, among other things. If he wanted his protagonist’s name to sound “vaguely” X or Y to readers, those readers must necessarily not be X or Y themselves or they would recognize that the name is not real. I find it puzzling that an author would try to contribute to diversity in kidlit by making up an ambiguous but “ethnic” name. Sachar clearly took inspiration from Indian names, but the problem with trying to make up a name from a particular language/culture instead of selecting a real name is that you might be perceived as having gotten it wrong, either because the name doesn’t exist or because it’s actually phonotactically (linguistically) wrong no matter what language you claim it comes from. Or perhaps it somehow violates the naming practices of the culture you think the name “vaguely” comes from. You may end up insulting people. I also don’t understand why an author would try to make a character “broadly ethnic” instead of specifying their ethnicity. The fact that Sachar thinks Tamaya could be a lot of things indicates that he doesn’t know what her ethnicity or heritage are, but there’s no such thing as being generically ethnic in the real world. The interview makes it sound like Tamaya’s name is the only thing that marks her as “ethnic,” but if she were actually Indian- or Japanese-American, that should affect more than just her name. (I have not read Fuzzy Mud, so I can’t be sure Tamaya’s background, whatever it is, doesn’t affect her worldview or her family life or the foods she eats, but I’d be surprised if it did.) If Tamaya’s name is the only thing that makes her not a white/Anglo-American character, then naming her Tamaya Dhilwaddi isn’t contributing much to diversity in children’s books; it’s mostly window dressing. It sounds to me like Sachar hopes “ethnic” readers (whatever that means) will see themselves in Tamaya or somehow feel more represented because she has an “ethnic-sounding” name, but I’m not sure this will happen. Most readers won’t recognize her name as being like theirs; certainly no Japanese-American child will think Tamaya might be Japanese-American too. And Indian-American children might think her name sounds sort of like theirs but be disappointed that it’s wrong or made-up. Why not just choose a specific ethnicity and an authentic name for the character so that some children see real representation of themselves and everybody else knows exactly what kind of person is being represented? To be clear, I think all this matters because Fuzzy Mud is set in our world. It’s different in fantasy, in which there are different considerations; I’ll talk about this in Part II tomorrow. I also understand that parents make up names for their children in the real world and that you can write a book with characters whose names reveal nothing about their ethnicities, but I don’t believe either of these is Sachar’s intention in Fuzzy Mud. I’m curious what others think. Am I off base? Does Sachar’s reasoning about the name Tamaya Dhilwaddi make sense to you? How do you approach character naming and diversity? 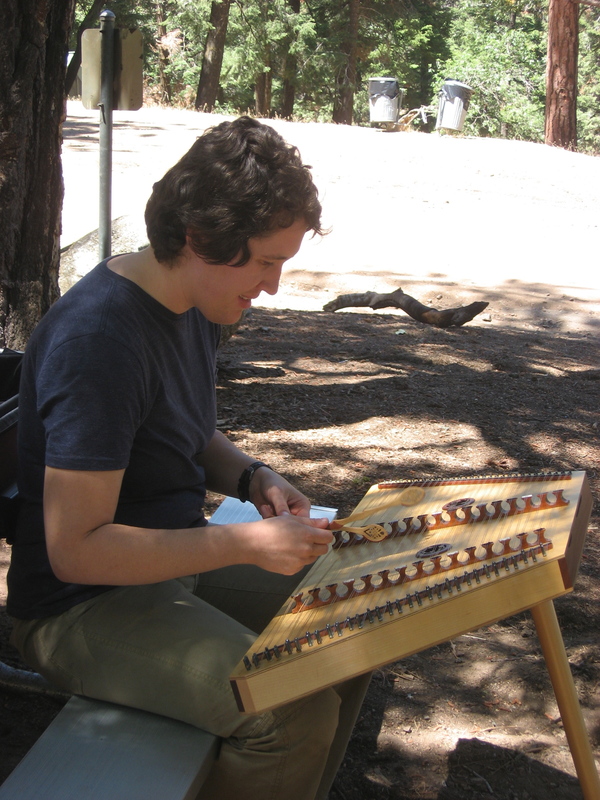 I spent the first half of last week at Camp Kiya, a traditional music camp in Tehachapi, CA. My friend Chase, a fellow student in my department, had heard about the camp, decided to go, and invited me to come too. We left on a Sunday morning in a rental car with one cello, one fiddle, one hammered dulcimer, a collection of Irish whistles, and camping gear and drove north across scrubby desert, through a forest of windmills in the mountains, and past a Norbertine monastery to Tehachapi Mountain Park. The park itself was not scrubby but wooded, with tall pines and live oaks full of mistletoe. We pitched our tent at a campsite on the other side of the hill from the cabins of the main camp, near some other campers’ RV. The three and a half days of camp were filled with classes in fiddle, cello, bass, guitar, harp, mandolin, accordion, mountain dulcimer, hammered dulcimer, harmonica, Irish whistle, ukulele, and bodhran, not to mention hula, Irish, and Cape Breton dancing. Styles and genres ranged from blues to classical, old-time to Scandinavian. There were lots of opportunities to pick up a brand new instrument, but I stuck to Intermediate/Advanced Cello and Celtic and Welsh fiddle. 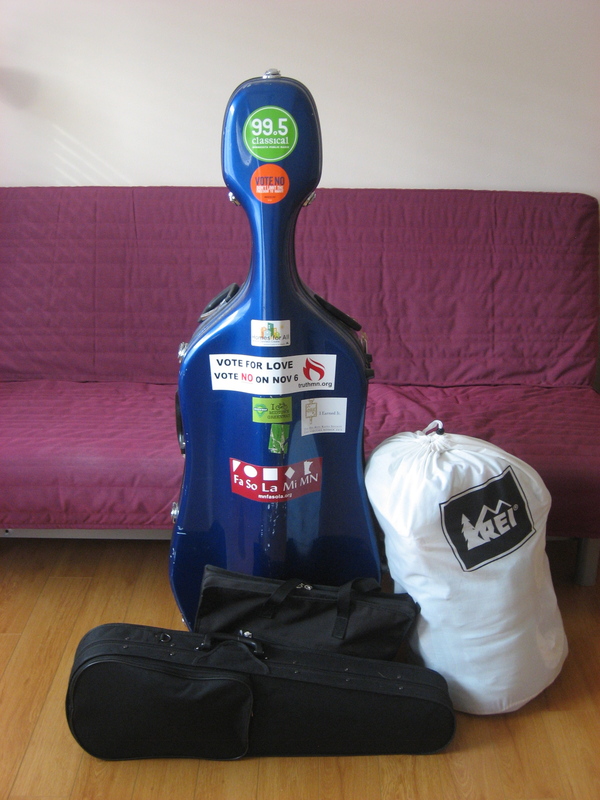 In each class, we’d learn a tune or two by ear, plus ornamentation or, in cello class, chords. There were certain tunes that recurred across classes. For instance, both the cellos and the Welsh fiddles learned a tune called Erddigan y Pybydd Coch (Lament of the Red Piper), and the cellos, mountain dulcimers, and accordions all learned the tune Crested Hens (Les Poules Huppées). 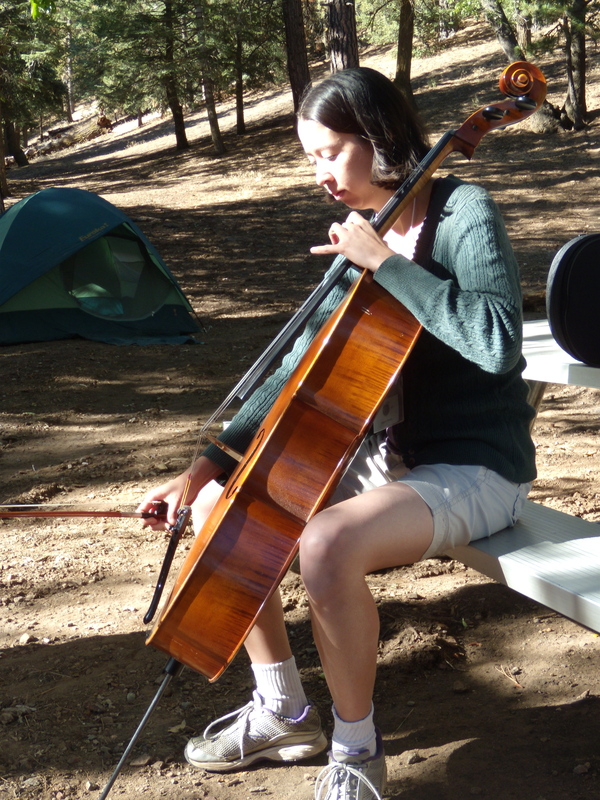 Part of what I hoped to do at camp was get better at accompanying on cello, because a folk cellist isn’t really expected to play melody much of the time. Well, I’m still pretty bad at chopping, but I did learn some stuff. I was also pleasantly surprised to find I could hold my own in a fiddle class despite having no formal training. The Scottish Fiddlers of LA tried to recruit me (although they may have been trying to recruit everybody…). One of the cool things about camp was that it was totally normal to be a multi-instrumentalist. In classical music circles, this is less common; you have your instrument, and that’s it (or maybe you also play the piano). At Camp Kiya, most people played two or more instruments: guitar and harmonica; bouzouki, whistle, and bodhran; harp and accordion; cello and mountain dulcimer. Another cool thing was how intergenerational camp was. There were cellists of all ages in my class. My Celtic fiddle teacher was in his eighties. There were young children doing fiddle and cello from scratch while their parents attended other classes. There aren’t that many settings in which unrelated people of all ages mix like this. The camp’s name comes from the Nuwa (Kawaiisu) word kiya, meaning ‘laughter’ or ‘play’. Nuwa is the language spoken by the indigenous people of Tehachapi; it belongs to the Numic branch of the Uto-Aztecan family. I learned about Nuwa from Jon Hammond, a camp instructor who owns a ranch in Tehachapi and is one of three fluent speakers of the language. We all heard him introduce his seven-year-old daughter, Kiya, in Nuwa on the first night of camp and also give a blessing in Nuwa at the ceilidh. The ceilidh was not a dance party but a camper talent show. It was held on Tuesday night at the fire circle. People sang and played and told stories and jokes. Chase and I sang a two-voiced version of Okro Mch’edelo, which, like all Georgian songs, is actually in three-part harmony. After the ceilidh, we joined the Celtic jam session in Cabin 1, wedging ourselves with cello and Irish whistle in a lower bunk in the corner. On Wednesday afternoon, after my cello class and Chase’s hammered dulcimer rehearsal, we sat in a nook on the footbridge between the mess hall and the fire circle and went through Chase’s Datvebis Gundi folder, singing more Georgian songs. As we sang, a fire crew tromped through camp, inspecting a dead pine and who knows what else. When we’d exhausted our Georgian repertoire, we also sang the tenor and alto parts of a few Sacred Harp tunes: Wondrous Love, Idumea, New Britain. Wednesday evening was the campers’ concert. Chase performed Ode to Joy in a hammered dulcimer trio and also played with the fiddle from scratch class. I played a set with the Welsh fiddlers (with my cello class backing up), then switched to cello for our two tunes, a bourrée and the amazing Raivlin Reel. We also backed up the Scandinavian/Nordic fiddlers on the Danish (?) tune Kingo P. Here is a video (by fellow camper Alan) of me with the Welsh fiddlers. The set is Erddigan y Pybydd Coch (Lament of the Red Piper) – Tri a Chwech (Three and Six) – Ymdaith Gwyr Dyfnaint (March of the Men of Devon) – Y Lili (The Lily). I’m not sure you can hear me, which is probably a good thing, but hey, my bow seems to be moving in the right direction most of the time!